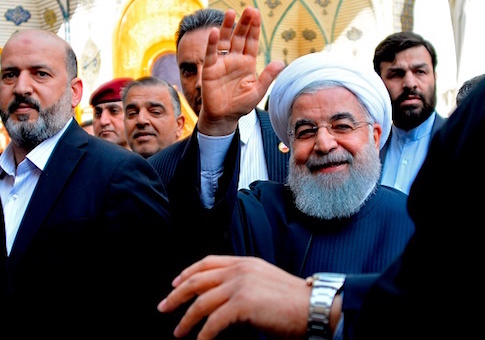 Iranian leaders have authorized and begun spinning a set of advanced nuclear centrifuges to mark the country's Iran National Nuclear Day, which leaders said is in honor "of all the jihadi efforts of our country's nuclear industrialists." "Today, and throughout the past year, we have launched 114 new technologies via the Atomic Energy Organization of Iran," Rouhani was quoted as saying in remarks translated by the Middle East Media Research Institute, or MEMRI. "This is the message to the world: You have not succeeded and you will not succeed in preventing the progress and development of the Iranian people and [their] scientists. If yesterday you feared our IR-1 centrifuges—well, here you go! As the nuclear centrifuges began to spin, Rouhani reportedly urged those in attendance at the event to "gloriously wave your [Iranian flags]" in "honor of all the jihadi efforts of our country's nuclear industrialists," according to MEMRI. The installation of these centrifuges marks yet another increase in Iran's nuclear know-how, elements of which remain legal under the landmark nuclear deal that President Donald Trump abandoned last year. "If you claim that you can block advanced technology with your sanctions—you are lying and you know it," he said. "Today, we launched a chain of 20 IR-6 centrifuges," he said. "If you persevere in your injustice and wrongdoing, you will also see a chain of IR-8 centrifuges in the not-so-distant future. You cannot prevent the scientific progress of the Iranian people. If the purpose of your sanctions was to diminish Iran's military power, know that in the past year—as you are fully aware—we have acquired missiles and weapons that you could not have imagined." This entry was posted in National Security and tagged Hassan Rouhani, Iran, Nuclear Weapons. Bookmark the permalink.